Last week, Nissan used the solar eclipse to try and boost its social media presence and gain it a spot in news headlines reporting on the popular event. First of all, Nissan North America’s headquarters created a piece of artwork on the front lawn to celebrate its position in the eclipse’s path of totality. The second thing announced was more exciting, because it was that Nissan trucks will now be available with the Midnight Edition appearance package. This popular package takes a traditional Nissan vehicle and turns its bright metal features black, a process that results in a “murdered” or “blacked” out car. According to Forbes, this package was first rolled out on the 2016 Nissan Maxima SR because dealers reported to Nissan that drivers were buying vehicles and taking them to aftermarket shops to have the process done themselves. The appearance package proved to be so popular that Nissan announced at the 2017 Chicago Auto Show that it would also be available on the Nissan Altima, Rogue, Murano, Pathfinder, and Sentra and paired with shades of black, gray, and white exterior color options. 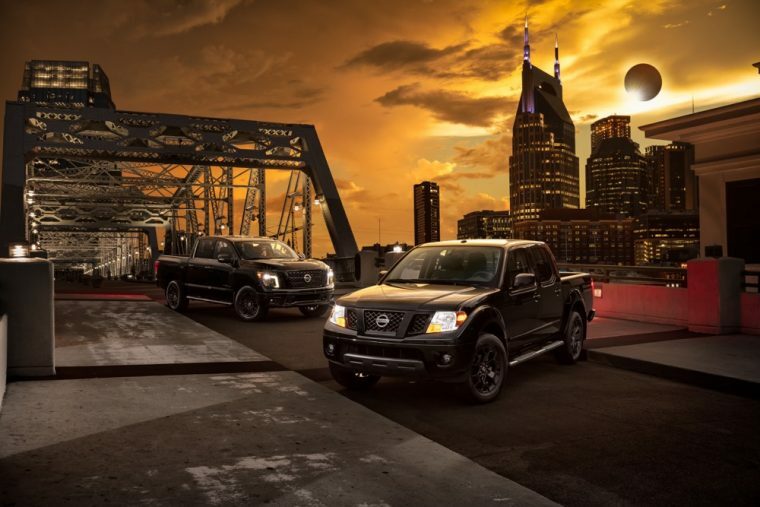 During the eclipse, Nissan announced that select trims ofthe Nissan Titan, Titan XD and Frontier will be the latest models available with the appearance package. That’s not surprising, given that the brand itself reports that Nissan Midnight Edition vehicle sell twice as fast as standard models. The updated features an equipped Nissan truck will have include a black grille, dark headlights, body-color front and rear bumpers, black exterior badges and black wheels. Pricing is not yet ready, but in the past it has cost less to buy the Midnight Appearance package from Nissan instead of purchasing features separately. The new option and complete details will be available in dealerships in late fall of this year.